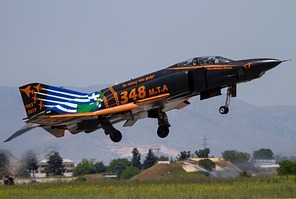 Hellenic Air Force RF-4E : The end of the film! On May 5th, 2017, the official retirement ceremony of the Hellenic Air Force RF-4E Phantom II took place at Larissa air base. Along with the aircraft, the 348th TRS ceased operations indefinitely after 64 years of service. 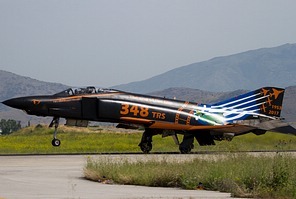 This author visited Larissa two days prior to the ceremony to capture the last three RF-4E for this historic moment. May 5th was the end of the last Recce Phantoms remaining in Europe, the last Recce Phantoms of NATO. The end of the film! 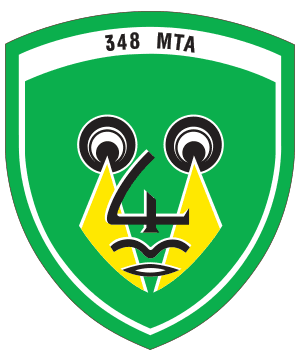 Without any doubt, the 348 Tactical Reconnaissance Squadron "Matia" (Eyes) was one of the oldest and most historical squadrons of the HAF. It was the only squadron of its kind with as primary role photo-reconnaissance. 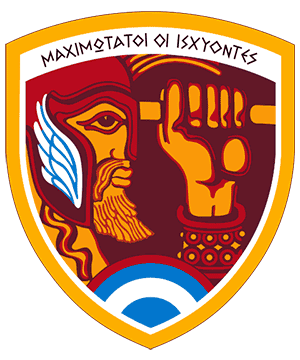 The squadron’s history can be traced back to 1953, when the unit was first established as a Flying Group based at Elefsina to cover the photo-reconnaissance needs of the former Royal Hellenic Air Force. It was assigned to the 112th Combat Wing and was initially operating six modified F-84Gs, which had cameras fitted inside their portside Fletcher wingtip tanks. In July 1954, the unit was relocated to Larissa, and one year later, in May 1955, it received 20 new RT-33A Silver Star aircraft and officially became a Squadron. The single-seat recce version of the T-33A was fitted with a camera in the nose and additional equipment taking up the rear cockpit. From August 1956, the then modern RF-84F Thunderflash replaced these aircraft. 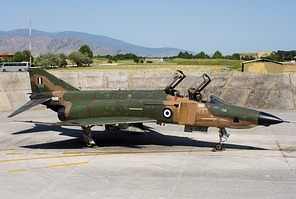 In fact, the Hellenic Air Force was the first NATO air force to receive the RF-84F and the RT-33As were provided to the French Armée de l’Air. The Thunderflash was far superior to its predecessor and carried out the photo-reconnaissance duty perfectly for the next 15 years, the RF-84F being the only NATO aircraft specialized in this role. The RF-84F proved to be very reliable, able to carry maximum fuel with the use of JATO and operating at higher altitudes avoiding enemy fire than its predecessors. The 348 Squadron was not the sole HAF Reconnaissance Squadron. For a period of 13 years, from November 1970 until the spring of 1983, a second reconnaissance squadron designated 349 TRS and equipped with RF-5As co-existed. Despite that the RF-5A was far more modern than the Thunderflash, the RF-5A operated at lower altitudes and carried a smaller camera, the 70mm KS-92A, because of the space constraint of its sleek nose. The 349 Squadron maintained its recce role, until in 1983 when it became a Day Interception Squadron upon receiving regular F-5A Freedom Fighters. 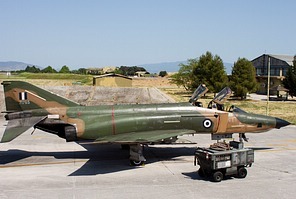 The RF-4Es were acquired as part of the second Greek Phantom order Peace Icarus II, which was signed on 22 October 1976. Greece ordered 26 new Phantoms, with 8 of them being the RF-4E photo-reconnaissance variant. 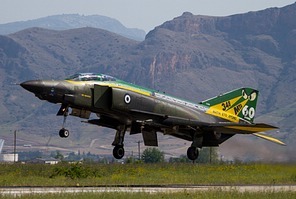 On 3 November 1978, the first RF-4E Phantom II serial number 77-1761 landed at Larissa air base. Deliveries were completed by the summer of 1979. Because the 348 Squadron would also continue to operate the Thunderflash, the unit was separated into two "sub-squadrons". The 348Sq/RF-4E and the 348Sq/RF-84F, each operating its own aircraft with its own personnel and infrastructure. In fact, it wasn’t until almost 10 years later, on July of 1987, that the two squadrons were finally merged. The performance of the modern RF-4E was highly superior to the older RF-84F as well as the RF-5A. Because of its larger size, the Phantom offered more room for more cameras and featured much greater endurance, despite its tremendous thirst for fuel. The RF-4E could carry three external tanks to increase its endurance, which was by far greater compared to the other two HAF recce types. Just like the fighter version, the Recce Phantom II could carry one 2.270lt capacity tank on the centre fuselage pylon and two standard 1.400lt tanks on the outer wing pylons. It is worth mentioning that supersonic speeds could be achieved with the outer wing tanks fitted. 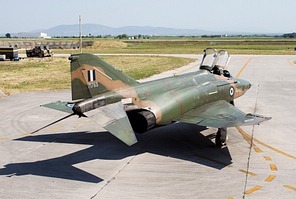 The Greek RF-4E was identical to the older RF-4C, apart from some small differences in electrical equipment. All Block 66 aircraft, their serial numbers were 77-357 to 77-358 and 77-1761 to 77-1766. The most important equipment was the KS-127A LOROP camera. Initially just two of these cameras were delivered along with the first 8 aircraft. The aircraft were also capable of carrying four AIM-9 Sidewinder air-to-air missiles (AIM-9L, -P2 and –P4) for self-defence. During the second half of the 1980s, their self-defence capability was upgraded with the addition of the DIAS package of self-defence and electronic warfare systems. This system was installed to almost all Phantoms in the HAF fleet, as well as the entire A-7 Corsair fleet. This unique, in terms of capabilities, camera had the ability to rotate during flight on its vertical and lateral axis. It offered the ability of taking accurate pictures from altitudes up to 40.000ft and at distances up to 35nm. Its accuracy offered great results with a detail up to 50cm. Its name is derived from the size of its lens. Initially the first models had a 50 inch lens (127cm), but later it received the bigger 66 inch lens. This particular camera was the best equipment for LOROP (Long Range Oblique Photography) missions. The camera was gigantic and comprised three different parts. The photos taken with the KS-127 camera were printed on a film which was 300m long! Responsible for the operation of this equipment was the co-pilot. The co-pilot was responsible of placing the aircraft at the correct trajectory for the photography, by using a special Viewfinder screen placed next to the radar screen in the rear cockpit. During these kinds of missions corrections were only within 4 degrees, so accurate management of the flightpath over the targets was the primary concern. In the mid 1980s, the HAF suffered two fatal RF-4E accidents. The first took place on 11 July 1985, the other on 7 May 1987. In one of these accidents, one KS-127A camera was also destroyed, it was later substituted with a new one ordered in the early 90s. The number of RF-4E aircraft had been reduced to six. When the HAF would decide to draw the curtain on its aging RF-84F fleet, a large gap would be created without any solution in sight. In the early 1990s, the HAF was desperately looking for a solution to bolster its photo-reconnaissance capability. The remaining 13 RF-5A of 349 Squadron were not able to fulfill all recce needs, while modification of some F-104G was not a viable solution due to room and endurance constraints. The desired solution was to get the surplus RF-4C aircraft from the USAF, these were being withdrawn from active duty at the end of the Gulf War. However most of them (if not all) went to the Spanish Air Force. On 29 March 1991, the RF-84F was finally withdrawn after 34 years of active service, leaving behind just a the six original RF-4Es to carry out this heavy task. A way out of this dead-end was offered by the German Luftwaffe. In the early 1990s, with the collapse of the Soviet Union the CFE (Conventional Forces in Europe) treaty agreement was signed between NATO members and Warsaw Pact countries to greatly reduce the armed forces on both sides. For that reason, the Luftwaffe (the largest export customer of the RF-4E) offered a great number of Recce Phantoms to its NATO allies in 1992. Greece and Turkey received 27 and 46 respectively. The first deliveries for Greece arrived at Tanagra air base in May 1993. 20 RF-4E went to 348 Squadron, while the remaining seven were kept for spare parts. Finally, after many years 348 Squadron was fully equipped with a single type, of course the ex-Luftwaffe RF-4E had some minor differences but it was the same basic aircraft. The ex-Luftwaffe aircraft were equipped with a KA-56 for low altitude (200ft - 4000ft) photography, a KS-87 front-facing camera, and a KA-91 with 18 inch diameter lens for panoramic view at medium altitude (5000ft - 25.000ft) photo shooting. Finally, there was one AN/PSM-37 Infra Red camera for day and night photography underneath the aircraft’s path, shooting straight down. All the German Phantoms were also capable of carrying the capable KS-127 LOROP camera. The German Recce Phantoms arrived in Greece without any self-defence system, only having the ALE-40 chaff/flare dispenser. The aircraft were soon equipped with the ALR-91 Airborne Warning System, including the newer ALE-47 chaff/flare dispenser system. 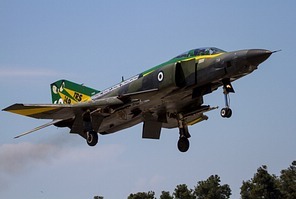 The ALR-91 system was also installed to other HAF aircraft, the 64 A-7E/TA-C Corsairs, the 28 second-hand F-4E SRA Phantoms and the remaining Greek Phantoms, which had not received the DIAS system. The biggest external difference between the original US-supplied RF-4E and the former German aircraft was the slats versus flaps on the leading-edge. The ‘American’ aircraft of Block 66 had received leading-edge slats, while the ‘German’ Phantoms are older models lacking the upgraded function. Instead, the older aircraft had droops (leading edge flaps). The slats’ function was to increase the speed of the boundary layer offering extra lift to the wing during high angles of attack. The improvement was first applied to Block 48 and continued to be incorporated until the end of the Phantom’s production. The 88 German RF-4E Phantoms however were Block 43 up to 47. Another visible difference used to be that all the German Phantoms had the lizard camouflage, which was standard for all Luftwaffe RF-4E’s at that time. Meanwhile the American aircraft had the South-East Asia paint scheme (‘Vietnam camouflage’). However, later some of the German Phantoms in HAF service were repainted in the Vietnam camouflage after a major overhaul. The lizard camouflage seen on the ex-Luftwaffe aircraft was either Norm 83A or Νorm 83B at first, but later on a changed lizard pattern was adopted. Also worth mentioning is that all the RF-4 aircraft, irrespective of the model, do not have the fuselage missile hardpoints like on F-4, as the Recce type lacks radar and therefore fuselage pylons for the AIM-7 Sparrow missile were not needed, the RF-4 versions do have the wing pylons. The German RF-4E Recce Phantoms however did not have the ability to carry Sidewinders on the wing pylons though. This was later solved by Greek technicians who installed the necessary cable wiring to add this ability for self-defence to the ‘German aircraft’. The ‘German’ Phantoms never had the DIAS self-protection system of the ‘American’ RF-4E. The DIAS system recognizable by the two large antennas fitted on the intakes, just above the roundels, and two smaller ones, one underneath the radome and one on the top of the tailfin. Another difference was the absence of the three yellow stripes for night formation flying across the fuselage of the German Phantoms, and also the different locations of the UHF and TACAN antennas along the fuselage. Finally the American aircraft had slotted stabilators and modified camera bay underneath the nose. The era of electronic reconnaissance started at the start of the millennium when Greece ordered ASTAC electronic intelligence (ELINT) pods. The ASTAC (Analyseur de Signaux TACtiques –Tactical Radar Signal Interceptor and Analyzer) system had been developed by Thales was operational on the French Mirage F-1CR, but also gave the Japanese RF-4E its ELINT capability. The trials took around two years and finally in 2003 the system was operational on the RF-4E. Despite that the pod can transfer data in real-time to be handed off to ground stations, the RF-4E could not support this feature, so the aircraft had to land in order for the technicians to retrieve the information for the intelligence office. The pod of 4,1m length and 40cm in diameter weighs 4 tons and could only be carried on the centerline pylon of the RF-4E. Surely the withdrawal of the Recce Phantoms leaves somewhat of a gap in the inventory of the HAF. There are different scenarios concerning the future of the reconnaissance role. One thing is for sure, the ASTAC system is still a vital component of the HAF’s capability and still offers many advantages in the modern theatre of aerial warfare. 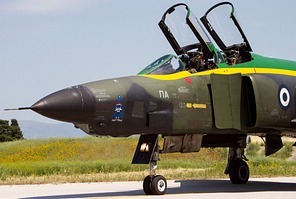 Unfortunately, the upgraded F-4E Phantom IIs of 117 Combat Wing at Andravida don't have the ability to carry this pod, so another type of aircraft has to be selected to utilize the pod. Most probably one Squadron operating either the F-16 or Mirage 2000 will take ELINT on as a secondary role, but for the time being nobody knows. 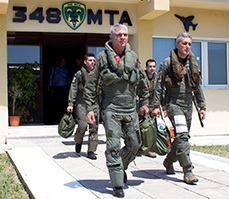 The most predictable future is that the HAF UAV Squadron, named Pegasus and currently based in Aktio, Preveza, will take over the base at Larissa. 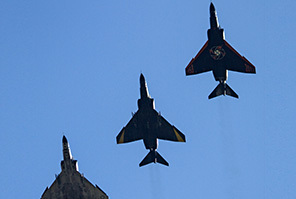 The remaining fleet of RF-4E Phantoms had been reduced to only three active aircraft in its final year of service. These were two ex-Luftwaffe aircraft, 7540 carrying the special markings of the 348 TRS 60th anniversary and 7499, which received the commemorative RF-4E retirement colour scheme with The End of the Film title and 181,000 flight hours markings. The third RF-4E remaining was the last ‘American aircraft’, 77-1765 with the standard Vietnam paint scheme. The fate of these three aircraft has already been determined. In mid June 77-1765 and 7540 will depart from Larissa for their last flight. The ex-German 7540 with 60th anniversary marking will goto Tanagra to join the small collection of preserved aircraft there, while the American 77-1765 will fly to Andravida and might be used for spare parts for the modernized HAF F-4E fleet that will soldier on for some time. 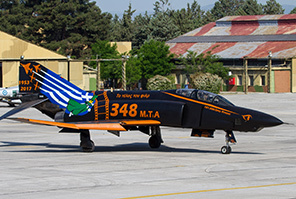 RF-4E 7499 with the final commemorative scheme will be preserved as a gate guard, where it really belongs, next to the general headquarters of Larissa air base. Despite the fact that the philosophy of aerial reconnaissance concerning the utilisation of dedicated photo-reconnaissance aircraft had already changed many years ago, nobody would argue that this “dinosaur"was offering some advantages compared to multi-role tactical fighters with only a camera pod. The RF-4E was a specialized reconnaissance platform that assumed the role of electronic reconnaissance with the ASTAC pod during the last two decades. The efficiency of 348 Mira never left any room for doubt about its existence as crews were achieving high rates of mission successes, while still using pretty much the same equipment that the RF-4E carried 39 years ago! But over the past decade the RF-4E had become very demanding and very expensive in terms of usage and maintenance costs. Back in 2012 when the HAF decided to gradually withdraw the type from service, it was estimated that the cost per flying hour was around €16.350! Unlike its modernised F-4E brother, the RF-4E’s legendary history stops here after 39 successful years of operation. 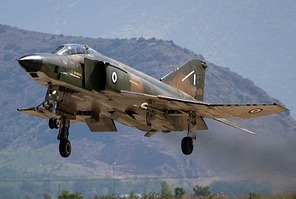 The Phabulous Photo Phantom will always be in our minds and in our hearts with its distinguishable shape and symbolizing the dedicated and specialized photo-reconnaissance capability that was enormously important to military planning before and even during the arrival of today’s technology. To the Legend of Photo Recce!